Dr. Travis Elliott graduated in 2015 from New York University with a Doctorate of Dental Surgery. 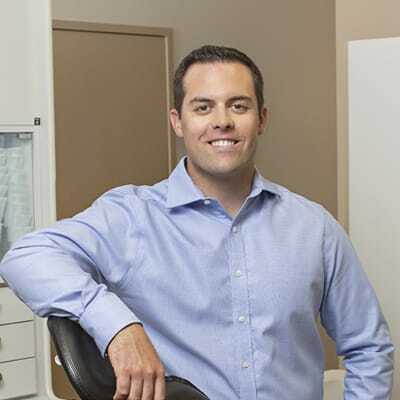 Dr. Elliott is a General Dentist at Sandstone Dental and looks forward to meeting new patients of all ages and continuing to serve the communities of Calgary’s NW. He truly enjoys all aspects of dentistry and has a special interest in Dental Implants and Invisalign orthodontics. Dr. Elliott keeps current by attending advanced education programs on the latest innovations in dentistry. His goal for your dental visit is to provide a calm, friendly and educational atmosphere, while providing excellent care and creating the beautiful smile you desire. Dr. Elliott is trained to offer dental sedation options for patients who experience dental anxiety. His patients appreciate his gentle approach while helping them to get their needed treatment. In their spare time, Travis and his wife enjoy playing golf, alpine skiing and camping throughout Alberta and British Columbia.